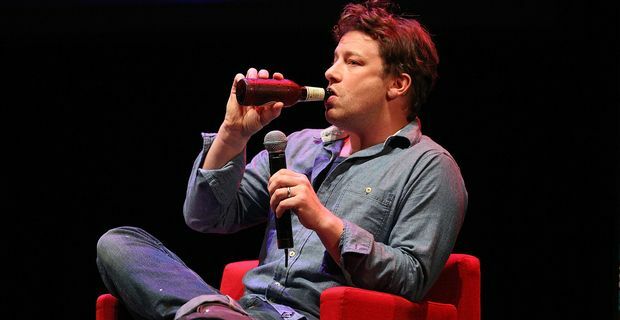 Naked chef turned podgy poverty pundit Jamie Oliver is copping some flak for his robust views on the eating habits of the poor. Oliver has expressed some discomfort at the notion of poor families settling down to a supper of convenience food in front of a huge TV and implied that they needed to get their priorities straight. Oliver, adept at the art of courting publicity, made the remarks in Radio Times, promoting his latest Channel 4 series Jamie's Money Saving Meals. He didn't mince his words. "Remember that scene in Ministry of Food, with the mum and the kid eating chips and cheese out of Styrofoam containers, and behind them is a massive f**king TV? It just didn't weigh up. The poorest families in this country choose the most expensive way to feed their families. The ready meals, the convenience foods." Oliver went on to criticise the poor for shopping in convenient supermarkets rather than buying a handful of veg at the local market. He seemed to ignore the possibilty that they might have seen a celebrity chef on those huge TVs urging them to shop at Sainsburys. Presumably Oliver has already cashed the cheques for those ads so doesn't need to plug the supermarket anymore. The patronising attitude continues when he encourages families who might be living in a tower-block in freezing Bradford to take a lesson from Sicilian peasants cooking up delicious pasta dishes from a handful of fresh tomatoes. Oliver has made his fortune from offering aspirational lifestyle cooking. When he turns his attention to healthy cooking for the poor, the smell is not of freshly-chopped herbs, but hypocrisy. The man who laments the unhealthy diet of the poor is the same man who offers a recipe for a Meatball Sandwich containing more fat than a Big Mac and more than double the calories, cholesterol, sodium and saturated fat, according to US medical analysis.